The main building at Roedean School has its main entrance facing the south, with four north/south oriented ‘Houses’ these being numbered 1 – 4; viewed from the cliff top house numbers run left to right. In front of the main entrance is an open area referred to as the quadrangle, at its south edge is a stone balustrade offering an uninterrupted view across the grounds and along the coast road to Brighton and Rottingdean. The area of the balustrade was referred to by the navy as the ‘Quarterdeck’, a revered area within a shore establishment, the site of the flagstaff flying the Naval Ensign – the Quarterdeck must be saluted by naval personnel when passing as a mark of respect. The School’s quadrangle doubled as a parade ground, the site of Sunday divisions (parade of ship’s company before church) at which the men and women of HMS Vernon would be addressed by the Captain and inspected. Before the end of the first year, more space was needed, both for accommodation and instruction; few rooms at Roedean were large enough to hold lectures for 200 men with the exception of the main hall, the gym, and at first the art school which later became part of the Wardroom. Suitable premises were found by requisitioning St Dunstan’s Home for the Blind at Ovingdean. This new building had opened in October 1938, but like the Girl’s School a quarter mile down the road, the organisation had been evacuated to Church Stratton, Shropshire in 1940. This site was used for several purposes, including an electrical instruction ‘school’, HMS Vernon’s central pay office, sub-lieutenants’ sleeping quarters and the ratings canteen and bar. From 10th September, 1942 members of the Women’s Royal Naval Service (WRNS) began arriving to take the six week long Seaman Torpedoman’s course, up to sixteen WRNS ratings a week,. This was a new specialisation for women serving in the RN as WRNS personnel were increasingly filling shore based roles in order to free up men for sea duty. New premises were requisitioned at 90 Marine Parade as instructional classrooms for these courses. In the first year of this new course 684 WRNS (T) had completed the course, only nine failed. 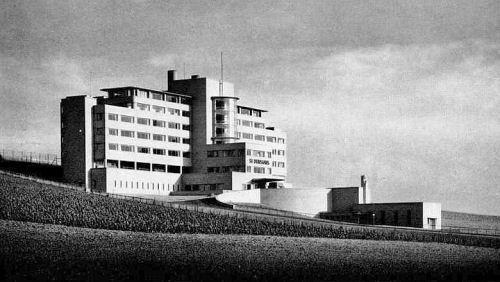 The number of personnel at Roedean was to rise steadily over the course of the war; rising from approximately 150 officers, 1,000 ratings and 100 Wrens during first year, increasing to about 250 officers – including 19 WRNS Officers, 1,500 ratings and up to 600 Wrens per year. Numbers would have been even higher had the Mining Instruction School not moved back to Vernon (P) in August 1943. A minor point of clarification: The house in Arundel Terrace used as Wrens quarters was No.7 and not No. 17 as stated. This is confirmed by the memoire of Muriel James, a Wren quartered there, held at the Imperial War Museum.